On this date in 1799, Napoleon Bonaparte gave, and saw executed, the dreadful order to slaughter thousands of Muslim prisoners from the Siege of Jaffa. Having just conquered the city from the Ottomans, the Corsican faced the inconvenience of having a large number of POWs with no way to provision them. What to do? His private secretary Louis Antoine Fauvelet de Bourrienne later remembered the scene. The Arnauts and Albanians, of whom these refugees were almost entirely composed, cried from the windows that they were willing to surrender upon an assurance that they would be exempted from the massacre to which the town was doomed; if not, they threatened to fire on the ‘aides de camp’, and to defend themselves to the last extremity. The two officers thought that they ought to accede to the proposition, notwithstanding the decree of death which had been pronounced against the whole garrison, in consequence of the town being taken by storm. They brought them to our camp in two divisions, one consisting of about 2500 men, the other of about 1600. The third day arrived without its being possible, anxiously as it was desired, to come to any conclusion favourable to the preservation of these unfortunate men. The murmurs in the camp grew louder the evil went on increasing–remedy appeared impossible–the danger was real and imminent. The order for shooting the prisoners was given and executed on the 10th of March. … the situation of the army, the scarcity of food, our small numerical strength, in the midst of a country where every individual was an enemy, would have induced me to vote in the affirmative of the proposition which was carried into effect, if I had a vote to give. It was necessary to be on the spot in order to understand the horrible necessity which existed. War, unfortunately, presents too many occasions on which a law, immutable in all ages, and common to all nations, requires that private interests should be sacrificed to a great general interest, and that even humanity should be forgotten. It is for posterity to judge whether this terrible situation was that in which Bonaparte was placed.† For my own part, I have a perfect conviction that he could not do otherwise than yield to the dire necessity of the case. It was the advice of the council, whose opinion was unanimous in favour of the execution, that governed him, Indeed I ought in truth to say, that he yielded only in the last extremity, and was one of those, perhaps, who beheld the massacre with the deepest pain. As tends to happen, this sort of thing made future garrisons much less interested in surrender. [W]e do not view it as the indulgence of an innate love of cruelty; for nothing in Bonaparte’s history shows the existence of that vice, and there are many things which intimate his disposition to have been naturally humane. But he was ambitious, aimed at immense and gigantic undertakings, and easily learned to overlook the waste of human life, which the execution of his projjects necessarily invvolved … That sort of necessity, therefore, which men fancy to themselves when they are unwilling to forego a favourite object for the sake of obeying a moral precept — that necessity which might be more properly termed a temptation difficult to be resisted — that necessity which has been called the tyrant’s plea, was the cause of the massacre at Jaffa, and must remain its sole apology. 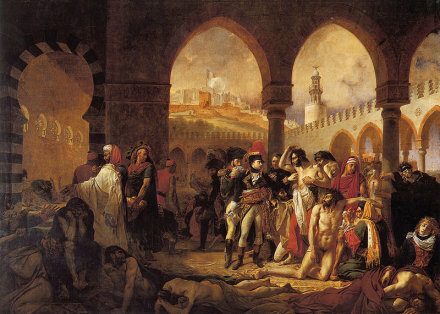 This city the French wanted so desperately as to “forget humanity” was beset with plague; Antoine-Jean Gros would depict Napoleon on canvas humanely visiting the stricken right around the time he ordered a couple thousand prisoners shot dead. Bonaparte Visiting the Pesthouse in Jaffa, by Antoine-Jean Gros (1804). [a]fter the siege of Jaffe the plague began to exhibit itself with a little more virulence. We lost between seven and eight hundred, men by the contagion during the campaign of Syria. * “Eugene” is Napoleon’s adopted son-in-law Eugene de Beauharnais, one of the commanders whose expedient clemency inconvenienced the marshal. Beauharnais’s father was executed himself, during the French Revolution. ** Bourrienne goes light on the atrocity details, and makes it sound like it’s all shootings; Muslim sources record bayonet work. † [sic!] By “terrible situation … in which Bonaparte was placed,” he of course means the terrible situation in which Bonaparte placed himself by launching his Egyptian campaign.